Over the last two weeks, the national media provided intense coverage of Hurricane Irene, Tropical Storm Lee and the surprise East Coast Earthquake, but only today seemed to notice that Texas is burning. Given the gravity of the destruction occurring in the Lone Star State, it's surprising to note that this news seems to be only a blip in the news cycle. 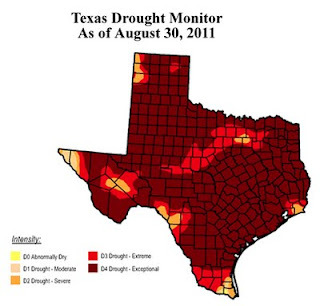 The entire state of Texas is experiencing the worst drought in more than 50 years with over 80% of the state considered "extreme drought conditions." This map from The Drought Monitor at University Nebraska-Lincoln puts it in perspective. As a result of the drought, there have been a record number of wildfires since the start of wildfire season last December. During this time, Texas has lost more than 3.6 million acres to wildfires, roughly the size of Connecticut, with damage estimates upwards of $15 Billion. Although we have been burning for months, the exceptionally strong winds from TS Lee this weekend fanned the flames, spreading fire quickly and making new fires difficult to contain. During this Labor Day holiday weekend, more than 60 new wildfires started on Sunday alone. On the west side of Austin a heavily populated neighborhood, Steiner Ranch, was engulfed by fire, forcing evacuations. It is still burning today. Leander and Pflugerville, suburbs of Austin are also threatened by massive wildfires that are not fully contained. Several fires on the east side of Austin near Bastrop began to burn out of control over the weekend. One of these forced our family members to evacuate the family ranch several miles away on Sunday. The fires in Bastrop have grown into monsters and even today are still forcing evacuations and threatening lives and homes. It is being reported that over 30,000 acres and more than 600 homes are destroyed as the Bastrop fires stretched over 16 miles in the last two days, and more than two thirds of Bastrop State Park, home to several endangered species has now been consumed. 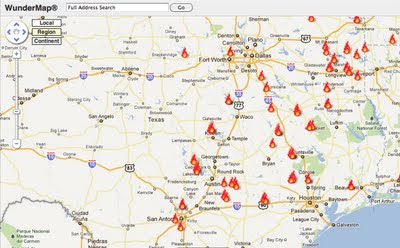 Texas wildfires are not limited to the Austin area, but may be found throughout the central and east side of the state. Areas in and near Houston, Dallas and San Antonio are also threatened by raging wildfires. Monday afternoon, a new fire burned 1,600 acres, forcing the evacuation of 8,000 residents in Magnolia, a rural suburb northwest of Houston. Firefighters struggled to control the spread early Tuesday morning. Pictures from the Texas wildfires this weekend express the seriousness of the situation. Governor Perry left the campaign trail in South Carolina Monday to return to deal with the fire situation in Texas. It is shocking that a number of people are criticizing him for putting his job as Governor ahead of a political campaign for President. Even though our state has been threatened with wildfires for months, the intensity and danger to so many residents from the fires this weekend makes it incredibly appropriate for him to leave the campaign trail and come home when he did. The proper place for a Governor in a time of natural disaster is in the state he was elected to lead. Cooler temperatures and calmer wind conditions this morning should aid the firefighters in their dire mission to save land, homes and lives; however, the only thing that can truly stop Texas from burning at this point is rain. Please join us in praying for the safety of those in the path of the fires, the firefighters, all first responders, and rain.